All was nice, the mood was great!All singers were nice! Great music, great venue, awesome seeing Eric Clapton and his amazing band. Really enjoyed seeing Santana as well, wish his guitar was a little louder in the mix especially the high notes, but a great show from an amazing artist and great band as well. Steve Winwood amazing and the band as well. Really great to experience Gary Clark Jnr's great music and also enjoyed the opening band as well. Highly recommended. Order process and tickets all excellent. Good selection of food/drink/toilet facilities available on site. Liked the drinking water taps in the heatwave especially! Support acts were outstanding and very enjoyable. Waters laser effects were stunning, together with the music which included Pink Floyd favourites. His 2nd session was too political for my liking. I did not think it appropriate for a music event. Messages were also contradictory. Thankfully my disappointment did not overshadow the rest of the day. 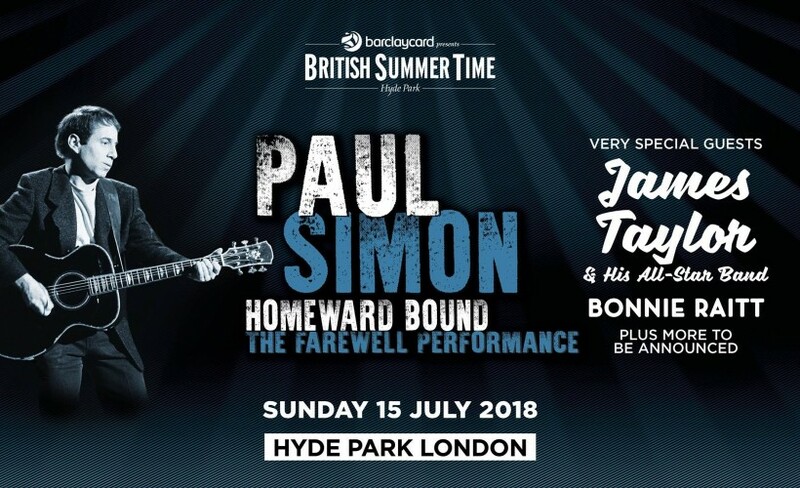 In London’s sweltering Hyde Park heatwave we were treated to three legends of American popular music: Bonnie Raitt, James Taylor and Paul Simon. Bonnie delivered a rootsy Americana show, James played his soft hits in the sunshine and Paul Simon and his enormous band picked judiciously from his catalogue, evoking audience singalongs with songs such as “Me and Julio Down By the Schoolyard”, “You Can Call Me Al” and one of his multiple encores “The Boxer”. Before closing thoughtfully solo on an acoustic guitar version of “The Sound of Silence”. It was a great show throughout but… for most of the time it was too quiet. OK, James Taylor and Paul Simon are not really known for bursting speakers and eardrums but, honestly, although the sound was crisp one had to listen for it most of the time like it was on a turntable in the room next door. Early on in Paul’s set the crowd were chanting, “Louder!” and “Turn it up!” And that’s not from an infiltration of Metallica or Motorhead fans. Seriously, at eighty-odd quid a ticket, this really isn’t good enough. And it’s not like British Summer Time is a brand new event. I have been to at least one show pretty much every year and would love to have given this a five star review but somebody had jogged the volume switch. Good job the audience knew the words to most of the set. Get tickets for Barclaycard presents British Summer Time Hyde Park with Gigantic!